Final Fantasy 5 advance had less than brilliant sound and this aims to restore the sound quality of the original SNES game. 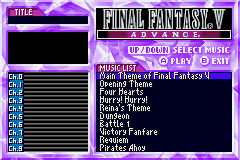 You will need to acquire a copy of the European rom of Final Fantasy V Advance. The patch is not designed to run with other versions of the rom. You will need to apply the patch (IPS format) to the rom with a patching program such as gbata. Read the included ff5a_mushack.txt for more information. 2.0 (October 29th 2011) : Completely redone the hack from scratch. Final Fantasy V Advance SNES sound restoration 2.0a NEWEST!